Lenovo isn't going to let Samsung have all the tablet fun today; its revamped A-Series tablets have arrived in the same formation as the Galaxy Tab 4 line-up that Samsung released earlier. 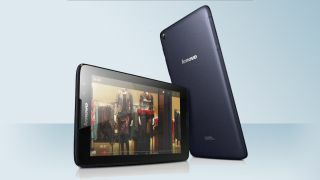 That means we're looking at 7-, 8- and 10.1-inch tablets, although Lenovo's gone one better with a fourth in its line-up. But like the Samsung Galaxy Tab 4 range, there's not much to choose between as all the tablets rock a quad-core processor and Dolby-enhanced speakers. The A7-30 is the lowest-spec tablet in the range, with Dolby-toting dual front speakers, a 7-inch screen and a quad-core processor under the hood, while the A7-50 is meant for those who want to read on the go thanks to its wide-view HD display. The A8 is, surprisingly, an 8-inch slate, with Lenovo pushing its media nous (Dolby audio, HD screen, quad-core processor) as well as the fact that it comes in a "range" of "bold" colours to "suit different personalities and styles" because you're all as individual as snowflakes and don't let anybody tell you different. Finally, the 10.1-inch Lenovo A10 also rocks Dolby speakers and a quad-core processor for "smooth video playback" although whether it will be any smoother than the A8's seems unlikely. If any or all of the Lenovo A Series tablets have tickled your fancy, you can pick them up starting in Q2 (any time from now until the end of June). In the UK, pricing starts at under £100 for the A7-50, £140 for the A8-50 and £170 for the A10. In the US, the tiniest tab will come in two versions; the Tab A7-50 and Tab A7-40 will both retail starting at $129. While the A7-50 packs a 2MP front camera and 5MP on the rear, the A7-40 lacks a back snapper. The A8 will be available from $179, and the A10 will be available for $299 with a Bluetooth keyboard bundle. Sans keyboard, the Tab A10's price starts at $249.